SUPERBOLT® Armored Machinery Tensioners of the MRA series meet the special requirements of high speed rotating machinery. 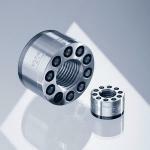 The jackbolts are recessed into the nut body to protect them mechanically from damage and to reduce noise. The jackbolts are captively mounted within the tensioner body and under no circumstances can they become free and cause damage. Bolted joints on high-speed machinery such as mining equipment, crushers, cutter blocks etc.